For a wide selection of the Audi Q5 For Sale in Lynnwood, visit us at Carson Cars. The compact Audi Q5 premium crossover comes equipped with either a turbocharged I-4 or a V6 engine, an all wheel drive system, and an automatic 6 or 8 speed transmission depending on the numeral extension. The Q5 earns a combined fuel economy score between 20 and 22 miles per gallon depending on the powertrain. The 3.2 offers a maximum towing capacity of 4400 pounds. The Audi Q5 has four trim choices: the 2.0T Premium, the 2.0T Premium Plus, the 3.2 Premium Plus, and the 3.2 Prestige. The 2.0T Premium features automatic windshield wipers and head lamps, power adjustable front seating with lumbar support, leather upholstery, tri region air management, roof rails, exclusive Audi MMI technology mounted on the dash, a CD player, satellite radio, and an audio system with ten speakers. Optional equipment includes heated front seating, a sunroof with panoramic visibility, and interface for Bluetooth and iPod connectivity. The 2.0T Premium Plus adds to that a power operated tail gate, xenon head lamps, and power retractable mirrors. The 3.2 Premium Plus trim gets larger wheels, a V6 engine, remote start and entry, and self cleaning head lamps. The 3.2 Prestige gains a blind spot notification system, adaptive head lamps, a cooled and heated container, a premium sound system with fourteen speakers, sunshades on the rear door, exclusive Audi voice command navigation technology with a rear visibility camera, MMI interface, and HD radio. Optional features on both 3.2 versions include twenty inch performance wheels and shift paddles. Audi Drive Select, cooled front seating and adaptive speed control can also be added to the 3.2 Prestige. The Audi Q5 earns high scores in impact protection safety tests. It comes standard with curtain airbags along the sides, side airbags in the front, stability control, tire pressure tracking, traction control and four wheel ABS, emergency brake assist, brake drying, rear door safety locks, whiplash protection head restraints, passenger airbag deactivation, and theft protection security. Audi provides a basic and drivetrain warranty of fifty thousand miles or four years driving and a free maintenance program of five thousand miles or one year of driving. 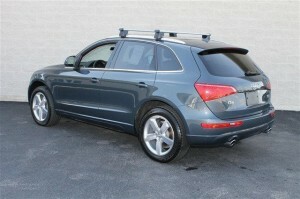 Contact us at Carson Cars 425-697-6969 to get more details about Audi Q5 For Sale in Lynnwood.